Achieve the appearance you want in your home or business with luxury vinyl flooring. In Colorado Springs, CO, Absolute Flooring America offers these excellent flooring products that are durable, versatile, and stylish. You may already know that vinyl is an inexpensive flooring option, but did you know that it comes in many varieties? Whether you want a vinyl sheet floor or a luxury vinyl plank floor, you can have a luxurious look at a modest price. Browse our large showroom for a wide array of vinyl floors in different colors, patterns, and price points. Why settle for less when you can have the best? Vinyl floors are excellent options because they are not only resilient, but they are manufactured to look like other flooring times: ceramic, hardwood, and natural stone. After you make your selection, we ensure your new floor is installed correctly. In fact, we are so confident you’ll enjoy your floor that we guarantee it. If within 30 days of installation you are not satisfied with your new 4-Star or 5-Star luxury vinyl flooring, we will replace it for free. In addition, we offer a lifetime installation guarantee on your floor. If you ever have an installation-related problem, call us and we’ll repair it for you. You cannot go wrong when you rely on us. We feature top-quality products, 12-18 month financing plans, and guaranteed installation services to ensure your complete satisfaction. Add aesthetic appeal to your rooms with luxury vinyl tile (LVT). Available in many varieties, LVT products give home and business owners limitless choices when they want to redo their floors. 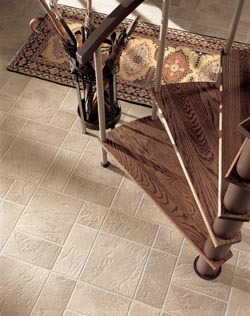 This flooring product is very affordable and easier to install than many other flooring types. They are also made to look like real tile with amazing depth and realism that fools even the most observant guests. If you have a bad feeling about vinyl floors, you may be thinking about vinyl from years past. Today, some customers prefer vinyl floors over other types. Now, you can have a high-quality vinyl plank floor that look just like wood or any other flooring material. It comes in all colors and varieties. The top layer is created using advanced photographic technology. It is also easy to install and remove if you want to replace it in the future. Take care of your floors the easy way. Install vinyl floors! One of the easiest flooring types to clean and maintain, vinyl flooring is durability and scratch resistance. Perfect for busy households and high-traffic areas, it only requires occasional sweeping and mopping. Best of all, it will last for many years. Contact us for a free consultation and ask us about our 12-18 month financing plan. We proudly serve Colorado Springs, Monument, Black Forest, Manitou Springs, Colorado, and surrounding areas.